Page 1 of 4. . . SPECIAL EDITION! 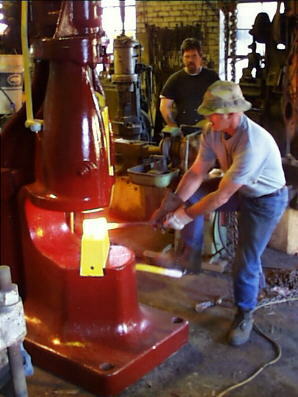 (LEFT) "New" 500 pound Chambersburg Utility Hammer at Greenwood Ironworks. Bruce Wallace (in back) watching Josh Greenwood forging stainless steel billet. Wallace Metal Work brokered the sale of the hammer to Greenwood Ironworks. 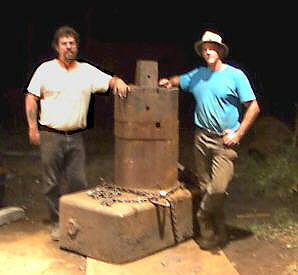 Bruce Wallace with Josh Greenwood next to 12,000 pound anvil for a 750 pound air hammer! Anvil is from a 750 Chambersburg self contained hammer and will be installed in a 750 Niles-Bement. GREENWOOD IRONWORKS is currently gearing up for the commercial production of components for blacksmiths. This very well equiped shop has added the 500 pound Chambersburg above and is installing a 750 pound Niles-Bement. These are in addition to a Nazel 1B, Fairbanks 100# and a 300# Bradley Compact hammer. A Nazel 3B is being replaced by the new hammers and is currently for sale. OBTW- Josh calls the 500 pound Chambersburg above, his "Little Red Hammer"!